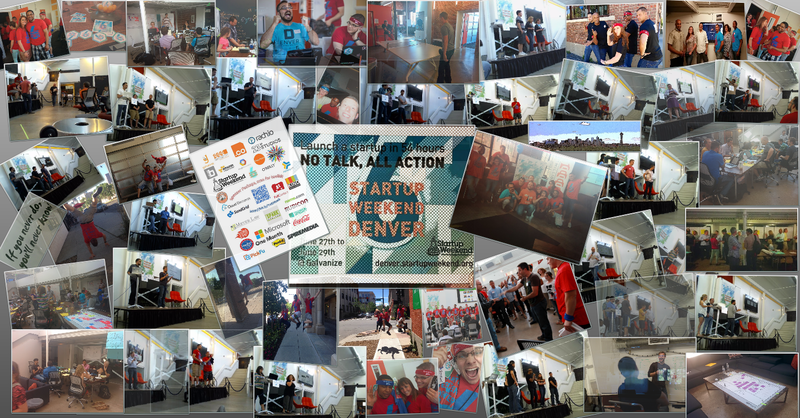 Startup Weekend Denver 6 fell in love with everyone that added to the innovative hoopla at Galvanize on 27 Jun. 2014. We challenged, invited and wrote poems for these individuals, all before knowing them. It was truly amazing how these teams responded to the challenge. We playfully rhymed about Raspberry Pi in our invitation post, none of us would have imagined a talented 10 year old girl and her team would make a creative toy and business from it, by golly! If you would’ve taken a bite out of what everyone pitched, inspirational gumption would’ve ensued. We asked everyone to turn the innovative page, they emphatically did so! So much so, surveys were sent out asking if anyone needed bandages for papercuts. From NASA engineers, to individuals that drove across the Great Plains of Missouri to participate in the creative ruckus at Galvanize. We even had people fly in from different states, someone flew in from Phoenix, Az, they definitely weren’t trying to escape the heat…. Startup Weekend Denver 6 at Galvanize was on fire! The evening started out with 40+ pitches, some ideas were more ambitious than others. Not everyone’s idea was chosen. Even if the idea was chosen, there was no guarantee those same people who voted for it, would be around to build it. That’s the ego-breaking truth, folks! Welcome to Startup Weekend, iterate and rapidly adjust to change, it’s the lifestyle. Life happens, start living! Orchid: Consolidates image processing, hosting, and distribution in one elegant solution. Think crappy internet images thrown through a beautiful digital blender. Apparatus: provides speciality coffee equipment sales and service for small to medium coffee roasters and service providers to make the process easier for cafes, and foodservice. Redfin of the coffee industry! Eye Poms: Peer-to-peer messaging via fuzzy kids toy. Think, like Furbies + Walkie Talkie S.O.S + Raspberry Pie + kids in a bottle. Team Ice Cream: Bringing ice cream trucks and ice cream lovers together. Think Uber or Lyft of the Ice Cream world, order your ice cream truck to your neighborhood via an app. TestMyTech: is an online tool that empowers recruiters to test technical skill sets online during the job application process. TMT will create simulated, real-life situational tests in areas such as SQL, Ruby on Rails and .Net to assess and confirm competency of the candidate prior to the hire. Self explanatory, no sugar coating your skills. 3rd Place | 10Plus: an app to connect sellers of services to local buyers. These services begin with a price point of 10 dollars and these services can be expanded on for more money. Buyers and sellers are reviewed after the service is performed. You tell me what services you offer and I pay 10 bucks or more for your services. 2nd Place | TaxTrax: Creating solutions for taxes on a mobile platform . Store my tax deductions digitally, I hate shoe boxes of paper receipts! 1st Place | FlashMusic: Pay to perform platform for non-professional musicians. Proceeds go to schools. NextStore: Next Store provides up-and-coming bricks and mortar retailers with a comprehensive expansion package including complete real estate, financing, and construction resources to grow them into their next retail locations and communities. My business is growing I need to move into a larger store front, help me! Keeps: transforms how users keep up with the things they care about. Content,bookmarks, notifications kept relevant to you. BuildingBrains: Developing a home automation sensor platform beginning with a Minimal Viable Product (MVP) of an unobtrusive survailance camera… inside your wall socket or peephole! BusinessBump: app that replaces business cards and simplifies the issues associated to them. Voyager: an online travel management tool for professionals and organizations whose businesses revolve around constant travel. We will begin by focusing on the music industry but progressing into other sectors who will also benefit from this tool.